It’s time for another October Horrorfest, ladies and gents! Same rules apply: watch as many horror movies as possible during October and I’ll report back in November. I’d been wanting to see Night Of The Living Dead for some time now; it’s part of the 1001 Movies list I’m working my way through. As I got my hands on this box set I decided to watch them all. Night Of The Living Dead was somewhat of a disappointment. I understand its importance in cinematic history but throughout I felt like I was watching a student movie. Dawn Of The Dead was the only movie here I’d seen before. It’s my favourite of the lot and the only one I have any real time for. 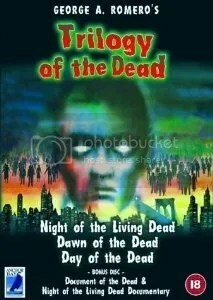 Day Of The Dead is a bad movie, in my opinion. I didn’t like it at all and was bored for most of it. And this is what doesn’t make sense to me. I love horror and quite enjoy zombie movies but not from the guy who pioneered them. I love a good horror movie. I particularly love a good vampire movie. And let’s get this out there right now: real vampires don’t sparkle. There. I’ve loved all things vampire ever since I read Dracula at the tender age of 12-13. Which ones do you think I’ve left out? Let me know. Spoiler alert! Every October ends with Halloween so of course this month is dedicated to Horror movies. I think towards the end of the month, I’ll list all the horrors I’ve seen. I may even rate them, watch this space. For now, I’ll leave you with one of my favourite horrors, which also happens to be the first one I ever saw: Alien.